This is incredibly sad article is further proof that outdoor advertising is simply incompatible with public space. I know Anya of the House of Yes through friends, and she is a nice woman who has been seduced by the money that advertising is willing to pay for outdoor space. Her folding under the pressure of money is not her fault, but our collective fault for allowing advertising to use its incredibly large resources to sway normal citizens to profit at the expense of the rest of us. 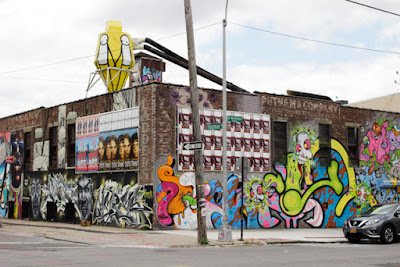 If advertising was not allowed in our public spaces we would continue to enjoy Bushwick as the arts mecca that it is, instead of watch the artists efforts be subsumed under a glut of paid commercial signage.